Precise genetic counseling and prenatal diagnosis are often hindered by incomplete penetrance of risk variance and complex patterns of inheritance. Here, we performed a clinical and genetic study of a five-generation Pakistani family with a history of multiple cases of childhood brain tumors. Six affected individuals died of brain tumors at very early ages and three were confirmed as having a homozygous mutation in exon 6 of the PMS2 gene (c.543delT). 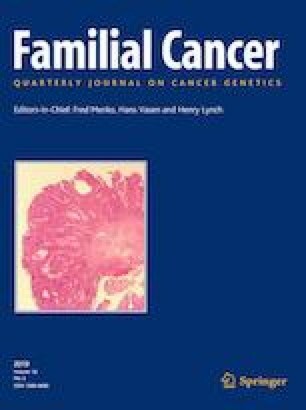 Fifteen members of the family were identified as heterozygous carriers of this mutation with a lack of cancer incidence. Both clinical manifestations and genetic test results of brain tumor patients in the family support the diagnosis of constitutional mismatch repair deficiency (CMMRD) syndrome, a condition in which individuals carry homozygous germline mutations in mismatch repair machinery genes with an early onset of malignancies such as glioma. This information was used to guide prenatal diagnosis with genetic testing on chorionic villus samples for the family. This is the first report of prenatal genetic diagnosis of hereditary brain tumor. The online version of this article ( https://doi.org/10.1007/s10689-018-0112-4) contains supplementary material, which is available to authorized users. We would like to thank Uzma Abdullah (HMGL/NIBGE of Pakistan) for her coordination of communication with the patient family and Maggie McIntyre (Genetron Health Technologies Inc of USA) for editing the manuscript. This study was supported by Higher Education Commission (HEC) of Pakistan Projects No. 1461 and 4865 (S.M.B). H.Y. receives royalties from Agios Pharmaceuticals and Personal Genome Diagnostics. H.Y. and S.W are co-founders of Genetron Health (Beijing) Co. Ltd.